In 2012 our founder, Natalie Lucas, attended the UN climate conferences in Doha, Qatar. She met with US negotiators who told her that in order to address climate change we had to build political will. She talked with other young people from all over the world, and although the climate movement has significant support from the public, it was hard to tell because of the loud opponents. We all needed a way to unite and declare that we agree that governments need to address climate change now. 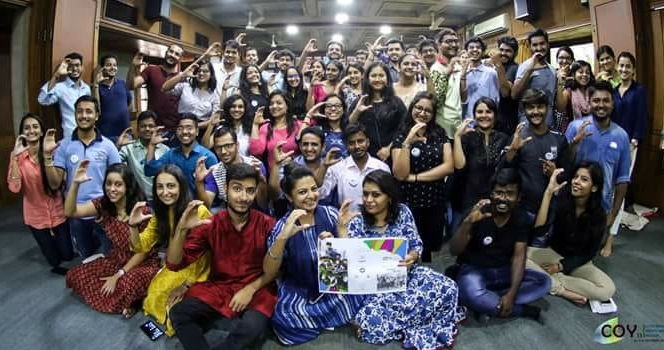 For two years a coalition of young people worked to develop a climate symbol, which was an image that could be used like the peace sign for the climate movement. Care About Climate was founded in 2014 to help promote this marketing and climate communication work. Leading up to when the Paris climate conferences, Care About Climate gave presentations across the US to teach people about the Paris agreement, US climate policy, and what they could do about it. On the Road Trip to Paris the symbol made its debut. In 2015 the hand sign was paired with the symbol to create ClimateSign.org, and the hand sign was illuminated on the Eiffel Tower during the UN Climate Conferences. After the Paris Agreement was signed, Care About Climate made a strategic decision to focus on two primary objectives. First was to support ClimateSign.org as a coalition to do marketing and communication campaigns in order to build political will to address this issue as quickly as possible, and to support adaptation for communities already being impacted. The second objective is to give young people tools to conduct local action in their communities to address climate change, and to have them use the Climate Sign to connect to the larger movement. We have been dedicated to that work through our Online Youth Exchange Program, and our Climate Ambassador program. We also send a delegation of youth to the UN climate talks each year to bring their local experience to the international level in order to influence global conversations. We do this day in and day out for our present and our future.